For your design inspiration today, we take a look at a selection of standout artwork from some well known and more obscure names in the music world and explore the images, typography and talent it takes to translate their sounds into a striking piece of artwork. This wild alt-rock outfit, hailing from Austin in Texas, are known for their theatrical live sets, which often result in most of their equipment being destroyed on stage. 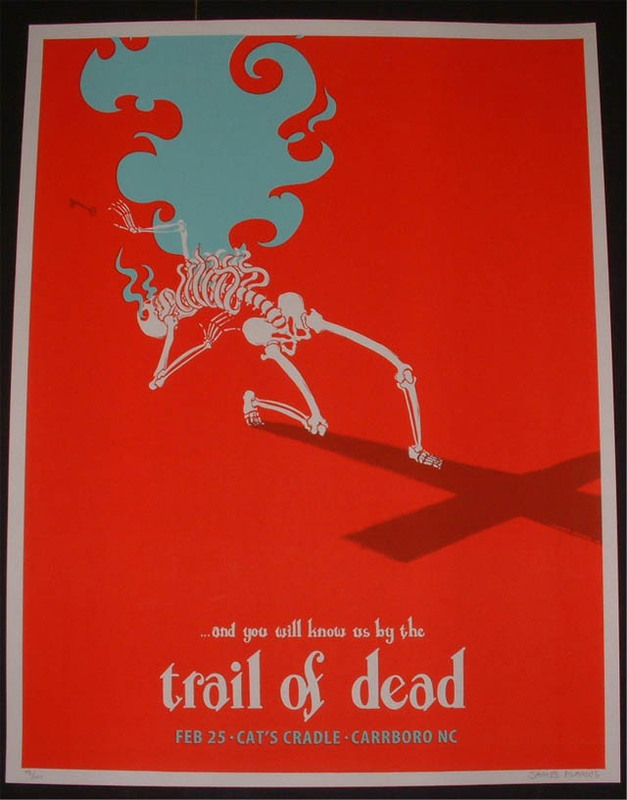 The chilling image of the skeleton enigmatic of films such as the Witchfinder General and other rural horrors such as The Wicker Man and simply, yet effectively, sums up their chilling name. Similarly the blood red colours and simple typography is reminiscent of films from the early 1960s period. In its colour scheme, simplicity and boldness this poster, designed by James Flames, is a brilliant visualisation of the ethos, musical style and mood of the band. This poster, designed for Brian Jonestown Massacre’s 2009 double-bill with Primal Scream at Club Nokia in Los Angeles, uses typography and illustration to give the psychedelic late 60s a burst of new life. 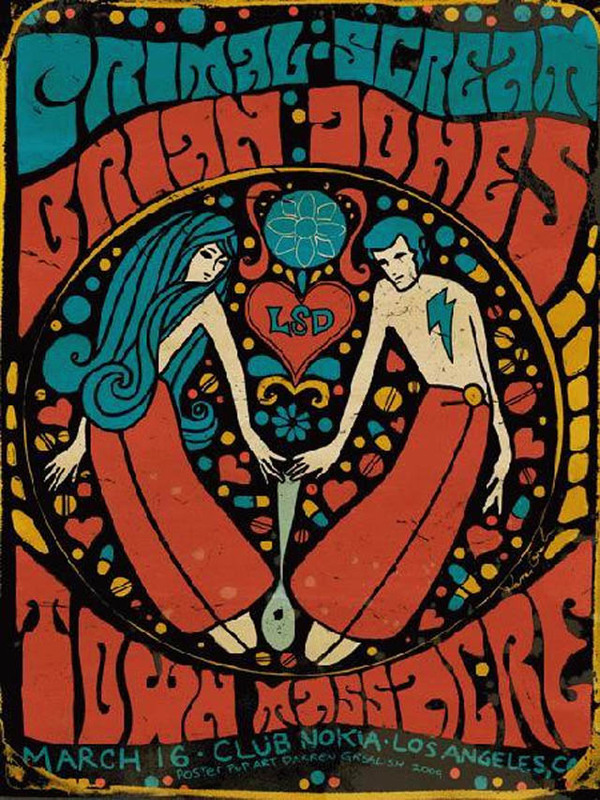 Similar to earlier artwork for bands such as The Grateful Dead and The Byrds, it clearly identifies the two bands major musical influences without falling into the realms of pastiche thanks to a clean colour palette relatively simple illustrative style. This Glasgow-based indie-pop band takes its name from the popular 1965 French children’s book by Cecile Aubry. 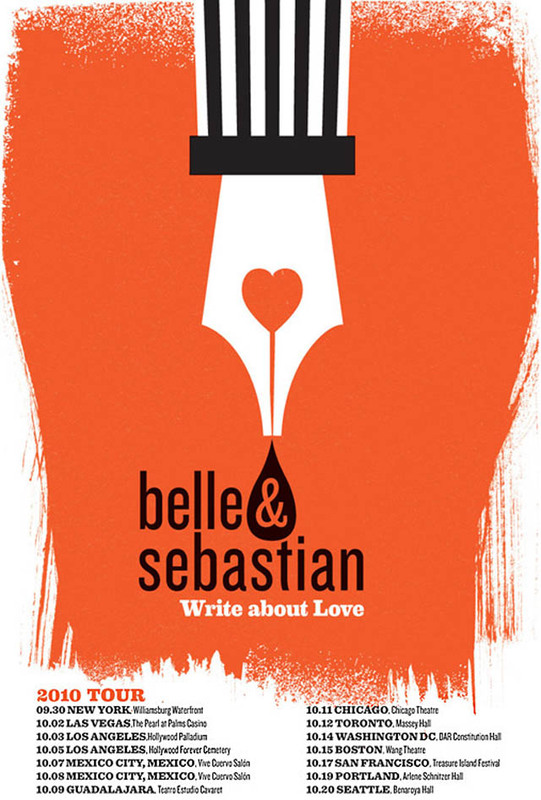 In the use of typography and iconic illustration the artwork clearly tips its hat to Belle and Sebastian’s Gallic origins. Designed to promote their 2010 American tour, it’s a loving homage to French New Wave cinema production, promotion, and the iconographic approach which helped to define French cinema during the late 1950s into the 1960s. The influence of Saul Bass, whose iconic style helped to characterise Hitchcock’s promotional material, is also in evidence in the stark monochromatic stripes, the stylised pen nib and the simple colour scheme of black, white and red. 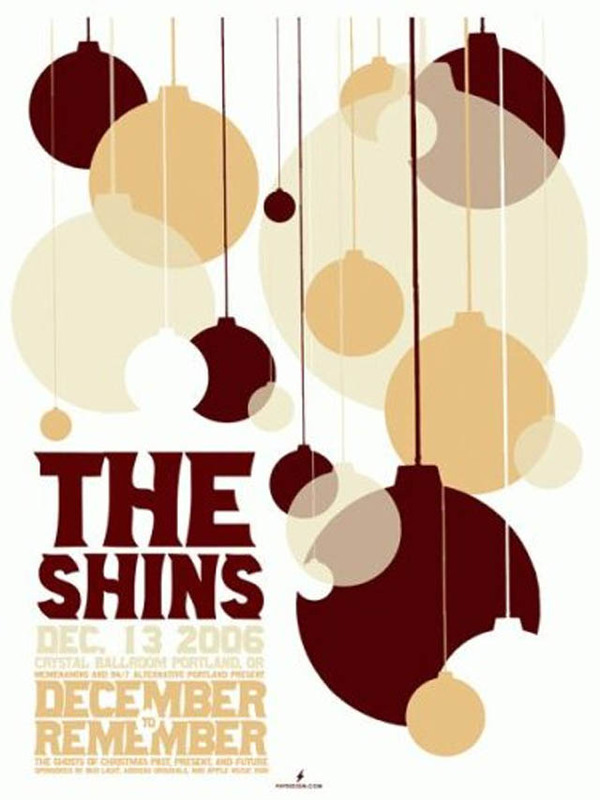 Designed in 2006 by Power House for their 2006 gig at the Crystal Ballroom in Portland, this poster takes the theme of Christmas as its starting point and fuses it with a typically East Coast lo-fi twist. The bleached out colour palette is in check with the band’s earlier albums Chutes too Narrow and Oh, Inverted World, both of which feature a similarly minimalist design-style. The white-out baubles and blanched typography lends a hazy feel to the work, and perfectly accentuates the band’s dreamlike, summery sounds in contrast to the festive theme of the December billing and Christmas conceptualisation. With the digital era at its peak, it’s clear that poster design still lives on, there is nothing more nostalgic and liberating then a good old fashioned poster. If this post inspires you to go out and make your own posters, I usually print my posters with YouPrint.com. Elizabeth is a freelance writer, designer and blogger. She enjoys writing about design trends, fashion, technology and marketing. When she's not working she enjoys hiking, camping and the outdoors. Really very nice post thanks for share…. thanks for share the festive theme of the December billing and Christmas conceptualisation. great! :D /old picture is nice! good site and good page! Ilike this glad for you. really an awesome gig poster design, I choose 3rd no design in this list. Thanks a lot for sharing us a nice and informational tutorial. Here we have provided complete information about the TS EPass Scholarship and procedure to follow while checking the status of TS Epass application. EPass facility is available for 10 districts including Hyderabad, All the candidates can check complete information of Epass here and also can check status here. Can’t say a word except WOW!!! Nice description and tips with innovative thoughts. Really Awesome. Good job ! and i also recommend with your title that, these gig poster designs are inspirational . I was and thought these was manipulated by a experienced hand . Thank you so much for this site for us.